OK, now and right before LeWeb starts tomorrow it’s finally time to post the remaining parts of the summary posts on the E20SUMMIT. I mean, LeWeb will no doubt lead to an avalanche of posts and tweets, cleaning up all the drafts is essential preparation. I’ve been looking back at the Wave use at the SUMMIT, at books and reports, and the social networking aspects of conferences, read people before – and I’ve already said that it’s been a good conference, with a lot of good discussions, and engaged people attending! We developed and discussed some great insights, and I want so say special thanks to all who contributed. Simon Wardley said that Enterprise 2.0 is a direction, not a state – and we’ve explored a bit of the road ahead together. This is so necessary as Enterprise 2.0 in my view is a question of competitive advantage. And while you (and companies) don’t NEED to change, it’s a good idea to change and adapt proactively. 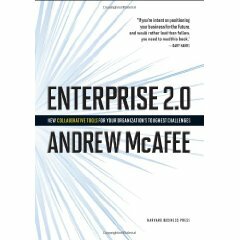 Hence, Enterprise 2.0 thought leadership has to deal with the naysayers and the Crockologists – and this push-back is good because it forces us to think through our positions and lines of argumentation, to look at the subject from different angles and perspectives and to sharpen our understanding of both technologies and implementation approaches. Of course there’s a place and rationale for Enterprise 2.0, and the many case studies provide ample support. Yet, we shouldn’t stop there and assume that uptake will happen naturally. It won’t – corporate resistance is real, thus finetuning Implementation and Adoption is important. Some learnings include that social it’s a bit of a tricky wording, like Andrew McAfee said during his keynote in San Francisco. Yes, words are important, and if you want to be effective it’s essential to test one’s own and the client’s understanding. Gil Yehuda argued that it’s a good idea to speak with the words your organization understands, ie. use the terminology that best resonates with the audience. And don’t use social or E20 like a mantra or mental short-cut, this will work only inside the E20 echo chamber. So we need to talk about tangible business values before we talk about technology, implementation or organizational change management. Yes, finding a non-IT team to run and foster the initiative is one good starting point. Plus, be not too picky about technologies or “solutions” – the best bet may lie in integrating different tools and let the usage emerge. We don’t want to recreate silos and “isolated effort” issues again, do we? One of my take-aways has thus been that it’s incredibly hard to choose between a “start small – think big pilot” and a “skip the pilot” approach. Yes, it’s necessary to demonstrate quick successes – but both can work and both are potentiually risky, yet for different accounts. In the first case resistance may argue that E20 only works in this special small group of E20-geeks (are they the right ones to drive enterprise 2.0? Too many IT-people from Mars will alienate the business folks from Venus …), in the second case roll-out steps and ideas for more general adoption throughout the enterprise must be thought and budgeted ahead. 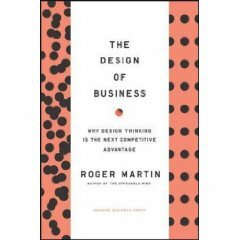 In both cases the best idea seems to be really adaptable, and willing to employ various transition strategies and ideas. We’ve repeatedly learned that frontal assault is foolish – eg. fighting against email is alienating (on the contrary it should be used as a transition tool) and should be replaced by a more guerilla like adoption approach. […] If you want to put data in the cloud that includes personal information of EU residents (and that might be something as simple as an email address or employment information), and the data will flow from the EU to almost anywhere in the world, you cannot simple throw the data in the cloud and hope for the best. Another learning focusses on the discussions of measuring collaborative performance – the scheme of how to measure effectiveness vs. efficiency presented by Kjetil Kristensen was insightful and stressed that effectiveness of collaboration efforts is often overlooked and neglected. Yes, the value of collaboration is not collaboration itself (and sometimes you don’t people to collaborate at all, think Chinese Walls in investment banking etc.) – the values of communication and collaboration across hierachical levels and “official tasks” are various: Thinking together, not thinking alike should be the goal, while buidling up mutual understanding. Tricky, huh? And here’s one link to the adoption and implementation issues from above: As knowledge and understanding of one companies’ vision of E20 is created in the conversation it’s essential to engage many stakeholders in the conversation, if only to connect the efforts with the actual business needs of the people. Gathering diverse perspectives and having meaningful conversations on the opportunities ahead ensures shared vision. 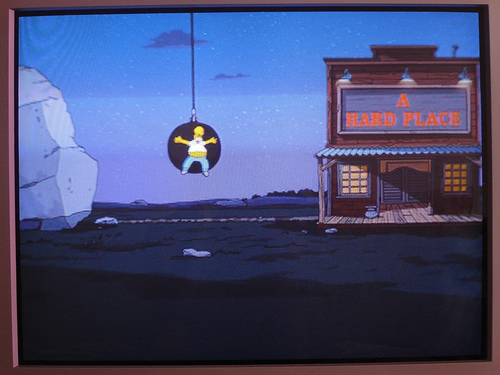 I’m stuck in the midst of conferences and end-of-year-accelerating projects, both adding to the workload (low-quality rock and the hard place picture of Homer ‘course copyrighted by Fox, obviously). Research is suggesting the Enterprise 2.0 technologies might introduce negative impacts productivity, decision quality and job satisfaction, in addition to the positive ones. What do we need to be aware of as we unleash these solutions on employees? Join me in challenging companies to address these soft challenges of Enterprise 2.0. Challenges that can potentially dilute the benefit of E2.0 and maybe even make employees less productive and happy. Either take a moment to consider these issues when plunging forward with deployments or add your comments to the blog so we can raise the visibility of these challenges. Yet I am expecting that the directory wave I prepared for LeWeb can help in collecting, systematizing and refining the various real-time content streams. Wave can be a very capable interactive venue, that’s allowing and enabling freeform collaboration, that is accesible and searchable by all, and that can help us master the “Information Candy Superstore” that LeWeb sure is going to be. […] You can also follow them all on Twitter with the official bloggers list. During the conference, you will be able to find all their posts about LeWeb’09 on a single page, with a single feed (thanks to Superfeedr). Another way to access their publications is through the LeWeb’09 Pearltree — just click on the Official Bloggers branch. So, I am in the midst of collecting and reviewing some of my learnings from the E20SUMMIT last week – let me start with Wave (after focussing on the people of the E20SUMMIT in part 1 here), and we’ll see how many parts will follow. While this Wave at conferences evaluation may seem not really focussed on Enterprise 2.0 at first it offers some insights and learnings for the ongoing discussions of adoption and organizational readiness. What do I mean? i think that during the SUMMIT both on-site and remote participants showed deep understanding of the usage of Wave for a conference backchannel – we’ve seen mature usage, ie. nobody misinterpreted the master- or the subwaves as a forum, as twitter substitute or as “facebook wall page”. People chose the channels that were most effective and they were professional at this. OK then, it’s about time to look back on last week’s E20SUMMIT – and as community manager of the event it’s natural to start with the people that made this event special. 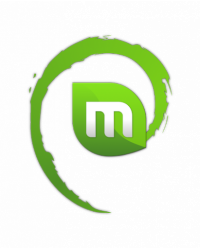 This includes the team behind it all, ie. people that have worked to make this real (and who have already announced the date for the E20SUMMIT 2010, so save the date Oct. 26-28, 2010). But even more importantly, this means the community that gathered in Frankfurt. I think we’ve had both lots of fun and an insightful conference. It was great to have you on board, thanks for your attention and interest and see you next year! From my personal perspective I can say that I really enjoyed this get-together of the Enterprise 2.0 community in Europe. Add to this some global scale thought leadership (Dion, Gil, Oliver, Kjetil, Lee and Simon – that’s you) and it was poised to be a great conference. The field of Enterprise 2.0 as a whole is still evolving and this was the first time I’ve met Gil Yehuda and Oliver Marks in real time, though I’ve been following their writings since long and we’ve connected virtually before. This is true for a lot of the people present in Frankfurt too – even for the community manager there’s a lot of first-time meetings (sometimes based upon a history of long-time blog reading and/or Twitter connectivity) and new-found blogs and friends. This includes folks like Rickard and Gustav from Sweden (see their blog), Torill from Norway, Mario (blog) and Massimo from Italy and Sean from London (who happened to be both in Varese and in Milano for Emanuele’s Enterprise 2.0 conference – yes, just like me and now we’ve met in Frankfurt for the first time, crazy, huh?). I think our little experiment turned up some pretty good conversations and real-time collaboration success stories. Not all of the prepared waves got filled extensively, but that’s ok. Not all of the attendees are bringing their laptops to a conference, and among those that have, not all are on Wave. So I am pretty satisfied and think that this is an excellent add-on and complements the “behind the scenes” doumentation in the wiki, the live-blogging and -tweeting around the E20SUMMIT (and of course the provisioning of the presentation slides). Today’s day one of the E20SUMMIT conference – after yesterday’s small circle masterclass with Dion Hinchcliffe. This means that most people will show up for the first time today, meaning that I must hurry up to get down to the reception area to meet ‘n greet some friends. The keynote panel discusses what needs to be included in an internal roadmap, as the core project specification and execution plan. It will address different case histories of successful strategic roll-outs, as well as giving insights from an international project at Sony PlayStation from a variety of specific European viewpoints. With the following parallel panels it’s a hard choice for me – but while I am definitely interested in best practices I decided to hit track 1 today, ie. the one focussing on Enterprise 2.0 strategies. Sadly this means I’ll have to skip some panels and sessions moderated or held by friends – on the other hand they can give me an account on what they’ve said anyway and I can do them a favour by reporting my collected observations from track 1. Many Enterprise 2.0 projects are faced with the question of how to measure the success of the initiative. The panel discusses the concept of collaborative performance and its operationalization as a way to determine and quantify the achievements of E2.0 projects. Participation as a means of gathering feedback from all parts of the organisation is a key element of Enterprise 2.0 projects. This panel focuses on how to best achieve this. Experts and practitioners discuss project structuring and feedback mechanisms, plus the pitfalls to avoid. Speaker: Julien Le Nestour, IT Innovation Manager, Schlumberger, Moderator: Lee Bryant, Founder and Director, Headshift Ltd.
Enterprise 2.0 initiatives share knowledge more widely around the enterprise, so leadership through superior knowledge is less relevant. This panel discusses new forms of leadership for knowledge-based organizations. From purely bottom-up, towards a top-down deployment, and gradually an integration of both – different E2.0 practices show a wide variety of implementation strategies. Each strategy needs a variety of evaluation methods. This panel compares differents approaches to measuring results. Discussion: Dr. Frank Schönefeld, Chief Operations Officer, T-Systems Multimedia Solutions GmbH, Bertrand Duperrin, Senior Consultant, blueKiwi Software, Moderator: Simon Wardley, Software Services Manager / Cloud Computing Strategist, Canonical Ltd.
For the majority of people in the enterprise, the words “Enterprise 2.0” means nothing. Telling the staff about tools and technologies will just get them thinking that it’s some IT initiative they can ignore. This panel discusses ways to explain the value of contributing content, commenting on other people’s work, leveraging the ‘friend of a friend’ network, developing internal weak-tie-communities of colleagues. Speaker: Gil Yehuda, Independent Analyst, GilYehuda.com, Moderator: Simon Wardley, Software Services Manager / Cloud Computing Strategist, Canonical Ltd. In contradiction to the U.S., pan-European companies are facing specific issues in regards to the different cultural backgrounds of their workforce. This panel discusses best practices and strategies to overcome these multi-cultural challenges for enterprise-wide adoption.